Arrakis from the developer Muad’Dib (69 Death Squad) is a new all-in-one Kodi Addon making its home in the Blamo Repository. It has categories named Messiah, 24/7 Movies and TV Shows, Arrakis TV, Movie Mania, Anime Toons, Documented, Sports Hub, Kids Play Room, Live and Loud, The Spice Room, Network Nation, The Voices Within, To Be a Hero, and Settings. Note that if you have the Blamo Repo installed already, you may need to update it to see the Arrakis addon. If the repository refuses to update, then you may have installed it from the old blamo.teverz.com address. See the new repo address and how to install it below. If you don’t have a VPN yet, grab the IPVanish VPN app to use with Kodi. They provide a 7-day money back guarantee to try it now risk-free. We’ve tried many, and IPVanish VPN is by far the best VPN for Kodi users. Having installed a few Kodi addons, you probably only need the Blamo Repository URL. You can use the new http://repo.mrblamo.xyz/ address. 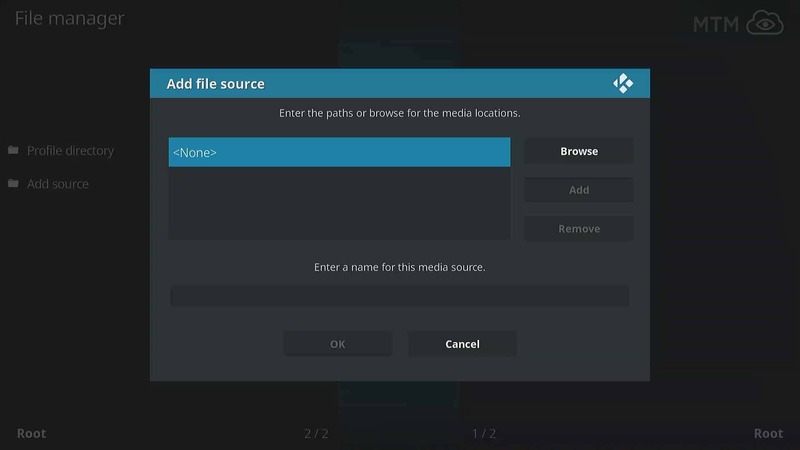 Before Kodi will allow this required step, you must first enable unknown sources. Above the main Kodi menu, click on the System Settings icon. Click on the File Manager. In the left menu, click Add Source. Click on <NONE> to add a custom resource location. Type in the URL http://repo.mrblamo.xyz/ then click OK.
Name this blamo then double check for typos and click OK. The Blamo Repo from @Daddy_Blamo (AKA MrBlamo420) houses many of the best Kodi addons available today. This repo is at the top of most best repo lists these days for the sheer number of fantastic working addons. Back at Kodi’s main menu, click on Add-ons. Click on the Add-ons browser (AKA Package Manager) icon. Select the blamo resource added earlier. Click on the repository.blamo-0.1.4.zip file, though the numbers in the file’s name may have changed. An alert should appear momentarily letting you know the Blamo repo installed. Installing Arrakis is a simple click, click, boom affair. There might be a few more clicks in there, though. While still in the Add-ons browser, click Install from repository. Then, click on the Blamo Repo. Now click the Video Add-ons directory. Last, click the Install button. Boom! You should now see the Arrakis Add-on Installed notice slide into place for a moment letting you know your mission the installation was a success. Need a Password for the Arrakis Spice Room? If you find yourself in need of it, note that the working Arrakis Spice Room Password is ArrakiPorn (NOT ArrakisPorn) and sometimes HappyFDay also works. Make sure you use protection! If the password has changed again and neither of those works, let us know in the comments; we’ll add the new one to the article. Special Arrakis Spice Room Access Note: Before Arrakis addon will even ask for a password to the Spice Room, you must change one of its settings. Head to Arrakis >> Add-on Settings >> Customization >> Enable Adult Menus first and turn it on for access. Enjoy this new all-in-one Kodi addon from Muad’Dib. It has a bit of everything and a ton of great working streams. Make sure to always use a secure VPN when accessing all the free videos the Arrakis Kodi addon makes available to you. Whats the password for the spice room please? Andrew, see my comment below to Edd. The ArrakiPorn password for the Spice Room is working just fine. Don’t forget to enable adult menus in the Arrakis Kodi addon settings, though. Arrakis won’t even ask for a password if you don’t do that first. Hey Edd, which password did you use? Some users have reported the ArrakiPorn password (not ArrakisPorn) worked for them even after not working once before. In fact, I just now did a fresh install of Arrakis to test things out. I successfully gained access to the Spice Room once adult menus were enabled in the Arrakis addon settings by using the ArrakiPorn password.